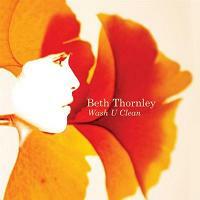 On Wash U Clean, Beth Thornley moves fluidly between funk, pop, gentle balladry and arena-sized anthems, all centered around the songstress’ flinty vocals and a mostly piano-driven palette of arrangements. Yet as the singer flaunts her fluency across styles and genres, a recurring theme arises in the form of a question: musically speaking, who is Beth Thornley? Taken on their own, the songs of Wash U Clean stand up quite well; Thornley and producer Rob Cairns continually show a flair for the innovative and a love of the dramatic, be it the string flourishes in “A to Z” or the masterful use of the E-Bow in “Everyone Falls” – with the guitar line giving Thornley’s wounded vocals a compelling harmony without even a word spoken. But where Wash U Clean ultimately stumbles is in Thornley and Cairns’ kitchen-sink approach to the album’s sound — even while individual tracks may benefit from the obviously considerable amount of attention paid them, the duo’s insistence on making an overtly varied album holds them back; by trying to do everything at once on a larger level, they’ve overshadowed a set of songs all capable of shining without outside help.